Hey, the name is Oxford. Yeah, I know it’s a bit unusual to have a shirt communicating with human’s let alone have one write a Blog dedicated to our perspective. This is just a bit of entertaining whimsy. Those who love randomness will probably enjoy this too! I have an interesting life, or at least some would say it’s interesting. The spokesperson for my story is this Blogger named, Maria Louise (aka smileywoman). I hope you enjoy it. One day there was a whoosh and a slant of light that entered the space where I lay. Rather quickly I was lifted by a pair of large, strong masculine hands from the shelf where I had been resting. Dizzy at the thought of no longer being inert, I was immediately dizzy as I was unwrapped from my pins and paper. The strong, large hands soon had me fully formed, unbuttoned and splayed open…’ready to wear.’ In one smooth movement I was wrapped around the form that belonged to those masculine hands. The man deftly buttoned shirt and cuffs and I was almost ready for my arrival. What’s this?! A form of restriction around my collar. Brightly colored silk wrapped into a tight knot. 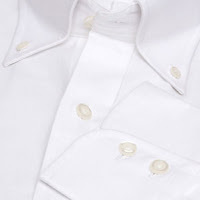 The heavy material flowed down in a wave to settle on my shirt front, covering my buttons. Suddenly the man bent forward and it was nearly my undoing! I’d never experienced an amusement ride, but I imagined this sudden pitch forward and down to be the same sensation that one would experience on a roller coaster. I wasn’t sure whether this was a positive or negative experience. The masculine form was tying some objects near the ground (shoes) and just as quickly as he had bent forward, he arouse to an upright position again. Anticipation filled the air as the man stepped out of the closet. This is the beginning of my story. Stay tuned for more details on my experience.